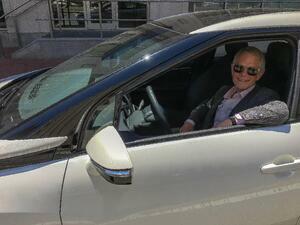 Gus Block, Director of Marketing and Corporate Development at Nuvera, testing one of the Fuel Cell Vehicles featured at the event. Nuvera’s focus for the past 25 years has been to supply zero emission motive solutions that make economic and environmental sense. We believe the growth and adoption of fuel cells for motive power applications is inevitable – and we are not alone. In the 2018 KPMG Global Automotive Executive Survey, 77% of respondents either absolutely or partly agree that fuel cell vehicles will be the real breakthrough for electric mobility. As industry professionals warm to the technology, Nuvera promotes the expansion of hydrogen applications through development of key technologies in new sectors. By developing new technologies, we have redefined what hydrogen means to us. Hydrogen can be viewed as a form of portable electricity – an energy currency that can be supplied by diverse sources, including renewables. In California, infrastructure projects funded by the state must have at least a 33% renewable energy component. As the technology becomes more widely adopted, renewable hydrogen should find its way into the fuel supply network - compounding the benefits already provided by fuel cells as a zero-emissions alternative to internal combustion engines by sourcing hydrogen from renewable production methods. As Massachusetts considers its infrastructure development for Zero Emission Vehicles, we’d like to see a level playing field for fuel cells. Battery EVs, while important in addressing the Commonwealth’s policy objectives, are not always the best technical, consumer, or environmental solution for zero-emissions mobility. Fuel cell vehicles generally provide longer range and shorter refueling times, and are often the best match for applications with intensive duty cycles – which can also be the most intensive polluters. Nuvera believes that fuel cells have a vital role to play in Massachusetts’ clean energy future, and can be a competitive alternative to both battery EVs and internal combustion engines. Our thoughts shared with the ZEV commission were well received, and speak to the thought leadership present both at Nuvera and within the ZEV commission.